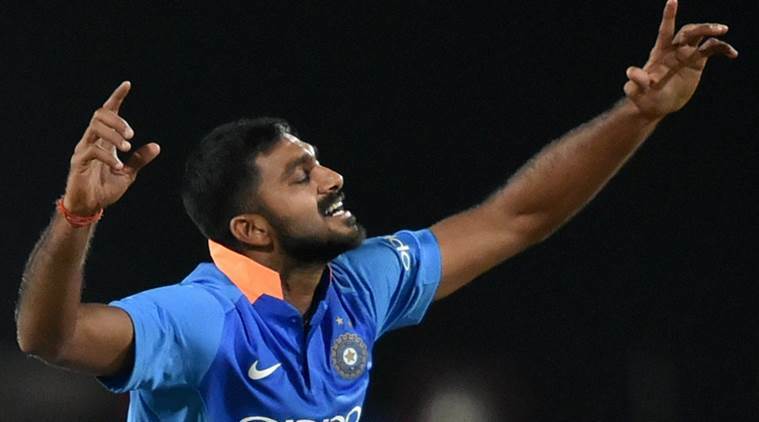 Vijay Shankar is expected to slot into the World Cup squad as the no. 4 having pipped Ambati Rayudu to a place in the team. All-rounder Vijay Shankar admitted that getting selected into India’s World Cup squad was a dream come true for him. “I am extremely elated to be in the Indian WC team. This is like a dream come true,” he said. Shankar could find himself in the playing XI as the team’s number four with chief selector MSK Prasad saying that he was preferred over Ambati Rayudu due to Shankar’s batting style and all-round abilities. Shankar is currently playing for Sunrisers Hyderabad in the Indian Premier League alongwith fellow Indian World Cup squad member Bhuvneshwar Kumar. Bhuvneshwar was also part of the Indian squad that reached the semi-final of the 2015 tournament. Apart from him, Kane Williamson, Shakib Al Hasan and David Warner are some of the other players who have played the World Cup before with Warner winning the title in 2015. Bhuvneshwar is also expected to play a big role as part of the pace attack with Jasprit Bumrah, Mohammed Shami and all-rounder Hardik Pandya. “I am extremely happy to be selected for the World Cup, the conducive English conditions will suit my strength and I am looking to make the most of it. Playing for SRH in IPL has given me the right match practice just before the mega tournament like World Cup,” he said. The selection committee has picked Dinesh Karthik ahead of Rishabh Pant as backup wicketkeeper to MS Dhoni. MSK Prasad said that Karthik’s experience and his better wicketkeeping skills were taken into account while making the decision. KL Rahul has also slotted in and is expected to play the role of backup to the openers. Ravindra Jadeja is the third spinner alongwith Kuldeep Yadav and Yuzvendra Chahal.